Abraham Lincoln was the sixteenth President of the United States, serving from March 4, 1861 until his assassination. 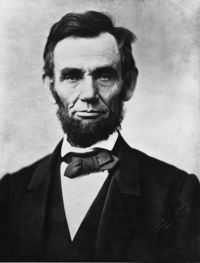 As an outspoken opponent of the expansion of slavery in the United States, Lincoln won the Republican Party nomination in 1860 and was elected president later that year. During his term, he helped preserve the United States by leading the defeat of the secessionist Confederate States of America in the American Civil War. He introduced measures that resulted in the abolition of slavery, issuing his Emancipation Proclamation in 1863 and promoting the passage of the Thirteenth Amendment to the Constitution in 1865. Abraham Lincoln and Charles Darwin have the same birthday. Whose birthday party would you rather attend?